Comedy Central’s Clusterfest tends to have a loose theme based around one of its headliners, with last year’s festival featuring Jerry Seinfeld on stage and Seinfeld-themed “comedy attractions” off the stage. This year is going a bit weirder with it, at least based off of the fest’s announcement video which announces that the whole thing will be based around The Lonely Island taking a magical, comedy-filled journey through Andy Samberg’s stomach. 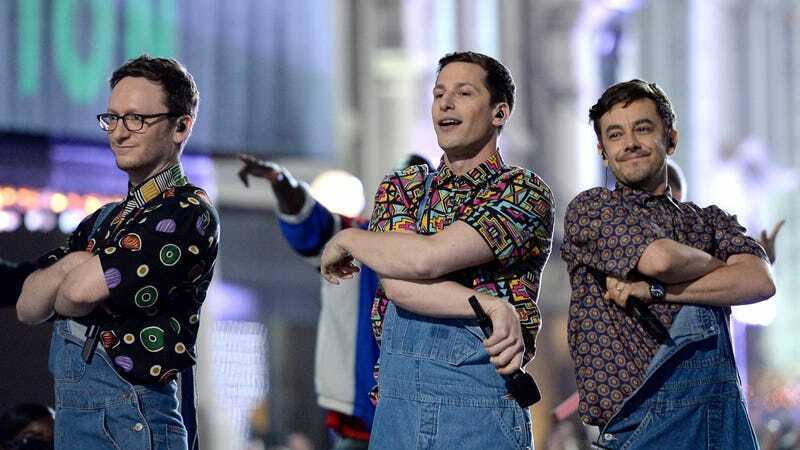 Naturally, The Lonely Island are one of the headliners at this year’s Clusterfest, which is being held at San Francisco’s Civic Center Plaza and Bill Graham Civic Auditorium from June 1 to June 3, and those three wacky boys will be joined by fellow headliners Jon Stewart, Amy Schumer (and friends), and Stewart’s Daily Show replacement Trevor Noah. Non-headliners include Tiffany Haddish, Jim Jefferies, Third Eye Blind, David Cross, Michael Che, Salt-N-Pepa, Maria Bamford, Kyle Mooney And Nathan Fielder’s Video Treasures, Reggie Watts, Drunk History, Lauren Lapkus and Jon Gabrus’ Raised By TV, and Sasheer Zamata—among many others. Attendees will also be able to tour The Daily Show’s Donald J. Trump Presidential Twitter Library, a South Park County Fair, and a replica of It’s Always Sunny In Philadelphia’s Paddy’s Pub—a location that should be particularly rowdy after this year’s Super Bowl. You can find more information about the whole thing at its official website.